The Ocean City Nor’easters showed who they were tonight at and matched the Philadelphia Union step for step right up until the last kick of the game. 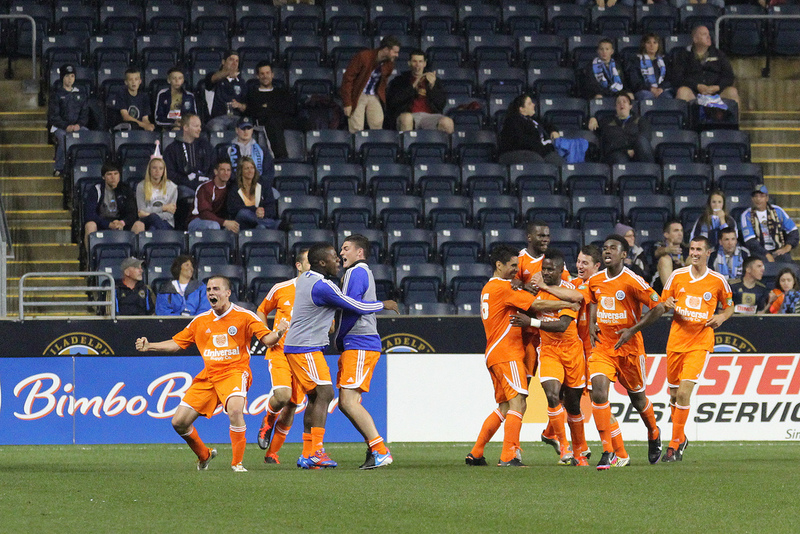 The Union scored a dramatic injury time winner to beat the Ocean City Nor’easters 2-1 at PPL Park. The Ocean City Nor’easters earned a lot of respect tonight and increased their visibility in the world of US Soccer and the Mid-Atlantic region through this performance. The Philadelphia Union started their best eleven available including the big names such as Conor Casey, Sebastian Le Toux and Jack McInerney. The Union started with the majority of possession but the Nor’easters limited their chances early on and played their way into the game. The Nor’easters attacked quickly and with speed to get at the Union full backs. On multiple possessions, the Union were able to pick out targets near the top of the Ocean City box, but play consistently broke down there, with the next pass often going backwards or to Ocean City. The Union only registered two shots on goal in the first half, the first of which didn’t come until the 19th minute when Sheanon Williams found room to hit a left-footed shot from 10 yards that was well saved by Brian Billings. Leo Fernandes was one of the few bright spots for the Union. After a nervous opening 10 minutes, the young midfielder settled down and seemed to find his game. The half would wear on with few chances going either way. Jack McInerney would fire wide of the near post from 18 yards, and Keon Daniel had a half volley well saved. The Nor’easters gained more confidence as the half wore on and the college players showed how well they can move the ball and unsettle the MLS professionals. Concerns over whether the youngsters could compete physically with the older pros was dismissed as the Nor’easters won many battles all over the field, especially Ken Tribbett in the midfield over Keon Daniels and Tapiwa Machingauta in defense controlled Union hard man Conor Casey. Boos rang out from around PPL Park from the home fans when the halftime whistle was blown. The Union fans expected a blowout before the game, even more so after the starting lineups were announced. The Nor’easters went back into the locker room knowing that there was a long way to go in the game. The Union came out stronger after the break, whether just needed 15 minutes to recover from the pressure from the Nor’easters or Union coach John Hackworth provided a stern half time talk, Jack McInerney finally found the missing bit of quality in the Union attack minutes into the second half. Sebastien Le Toux found himself with time to cross from deep in the right corner. Le Toux drove the ball across the box that found McInerney unmarked on the far post. The confident striker took a cool, controlling touch inside the six-yard box before tapping into the empty net. Ocean City would rebound from the goal with a spell of possession in the Union half. The Nor’easters pushed on and started making chances. Ken Tribbett, who dominated the midfield with Nick Perea, had a shot deflected wide but the best chance fell to Anthony Asante, who blasted over the bar from 20 yards when a rolling ball was played out to him. It was Keon Daniel who had the best chance to make it 2-0 when he had his fierce free kick from 20 yards saved at the near post by Brian Billings. It would be in stoppage time that the drama really unfolded. Just as the clock ticked past 90 minutes, Ocean City would find their equalizer. With the ball bouncing around the Union box after a header back across goal from Tapiwa Machingauta from a corner, Ocean City first had a shot saved off the line, only for Emmanuel Kollie to smash home the rebound. Extra time looked certain as all 11 Ocean City players (and their bench) celebrated on the touch line. But the Union regrouped in the remaining two minutes of stoppage time to win the cup tie. Hoppenot made his best run with the ball in the game, surging down the center of the pitch. He found Cruz cutting in from the outside and played in the winger. Cruz’s shot was saved and the rebound fell to Le Toux, who looked certain to score into an empty net, only for his shot to be blocked over the bar by the recovering Tyler Hilliard who through himself at the ball. Carroll would secure the win from the ensuing corner. Le Toux took the kick himself and Carroll met the driven ball at the near post, flicking it past a helpless Billings. The ball hit the back post and just barely crossed the goal line, no goal line technology to confirm this, before being cleared by the Ocean City defense. It was a harsh finish for an Ocean City team who looked to have done just enough to force extra time. The Nor’easters proved themselves as a top team and every single player performed magnificently. The college kids put themselves in the shop window for the professional sides to take a look at them and every player made a case as to why the MLS clubs should be looking at them come draft time. Nor’easters Head Coach Tim Oswald took questions after the game, "Every club wants to win the US Open Cup and they will get their best 11 at every game. We said that we had to play hard no matter what. When we saw the quality they were putting out there we knew the game was for real. And its 11 v 11 for 90 minutes and anything could happen. Just try to find a special moment. There is going to be more confidence on the team for our next matches for the PDL. It would have been great to host the game, but it was a great opportunity for some of the guys to play in a MLS stadium". Find out more information on the Ocean City Nor’easters by following our Facebook and Twitter pages. The Nor’easters next home game is June 23rd at Carey Stadium, 7pm kick off, aginst Jersey Express.